Google is blocking our site. Please use the social media sharing buttons (upper left) to share this on your social media and help us breakthrough. Growing up I was surrounded by Indigenous mascots from little league baseball to the pros. My confusion as a young white kid became an awakening to the reality of settler colonialism. 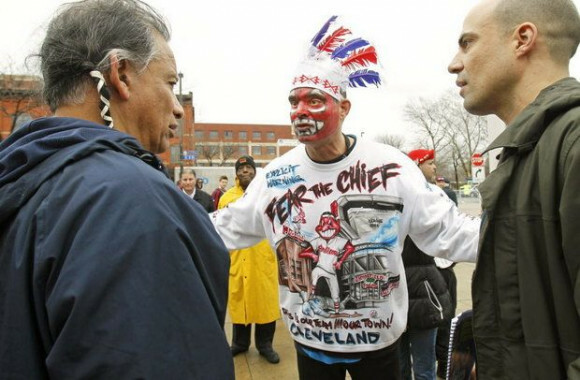 When I moved to Cleveland, it became impossible for me to overlook the overt racism of the baseball team’s Indigenous mascot. The transition to a new name and logo cannot come soon enough. When I was little I wondered why Cleveland’s baseball team was unique compared to others in the league. They weren’t the Cardinals, Giants, or Angels, but the “Indians.” I didn’t understand the significance then, I only noticed the pattern that one team was unlike the rest. Growing up outside Boston, I went downtown to Fenway Park each year to see a Red Sox game and would study the visiting team beforehand. For a handful of years, the Red Sox matched up with the Cleveland Indians in the playoffs. Kenny Lofton and Jim Thome were my favorite players for Cleveland, but when they came up to bat I was always confused by the logo on their uniforms featuring the red-faced man with a feather and an odd smile. As a young white kid in a pretty insular community, my perception of Indigenous people was limited to mascots, museums and textbooks. From watching “Cowboys and Indians” films in elementary school to the Redskins and Indians teams on television, I internalized exotic images and mythical ideas of “ancient peoples” who had once roamed the US. Like any child I had a lot of questions, but my classes spent little time addressing them. Then in college a close friend exposed me to a side of history omitted from my education and comfy childhood. He was from the Passamaquoddy Nation in northern Maine, and invited a couple of our friends to his home on the Passamaquoddy Reservation for an annual celebration with his family. Our friendship consisted of mostly humor that occasionally led to a more serious conversation, like the stark differences between our upbringings. My friend spoke frequently about how resilient his community is in the face of struggle; his reservation, like many others, is in a state of economic and environmental devastation. From surviving genocide to ongoing federal disinvestment, he taught me history is no thing of the past for him. He also told me of the most pressing issues there, from high rates of youth suicide, to domestic violence and alcoholism. During a conversation one day about our jobs working with youth, he brought up the phenomenon of Indigenous mascotry. He didn’t go into depth, but told me that for the kids in his community, Indigenous mascots nationwide are one of the most harmful factors to their development. I didn’t press him to say more, but wanted to keep learning. The following year back at college in Northeast Ohio, I took a Native Studies class, which featured a segment devoted to the history of Indigenous mascots across the country. We read scholarly articles of landmark lawsuits and social movements that focused on the many attempts to prevent these types of mascots from gaining ground in the US. Who knew that in 2001 the U.S. Commission on Civil Rights called for an end to the use of Native American mascots? My professor, the sole Indigenous professor at the school, told me about the annual demonstration against the Cleveland Indians on opening day at Progressive Field that had been going on since the 60s. He expressed that the annual event was a snapshot symbolic of late Native history in the US: white people yelling at Indigenous people for defending their basic human rights and dignity. Soon after I graduated I moved to Cleveland. Some of the people here love the baseball team. Others refuse to acknowledge them until the name is changed. Most of us who live in Cleveland are aware of the local divide. At most home games you can find both sides represented: from Indigenous-led protests outside the stadium, to thousands of fans heading inside wearing Chief Wahoo regalia, chanting “Go Tribe!” Many lifelong fans express a deep connection to the image of Chief Wahoo and the team name. Diehard Clevelanders talk about what it means to have supported the team since childhood. For many others, primarily Indigenous people, the Cleveland Indians organization has been a lifelong source of pain. As the trend goes, the people most harmed by a situation often have the least power to correct it– and had nothing to do with creating the situation to begin with. What will it take for those harmed to be heard, and at the center of change going forward? 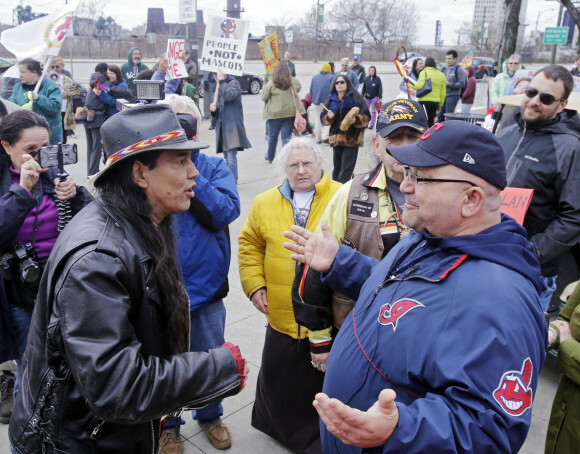 The Indigenous-led grassroots activism across Northeast Ohio that began in the 1970s has now influenced top executives of Major League Baseball to discard the name and logo of the Cleveland baseball team. Last month the Cleveland Indians were in the news once again due to the continued dispute between team owner, Paul Dolan, and Major League Baseball officials concerning the removal of the “Chief Wahoo” mascot, in addition to the team name. 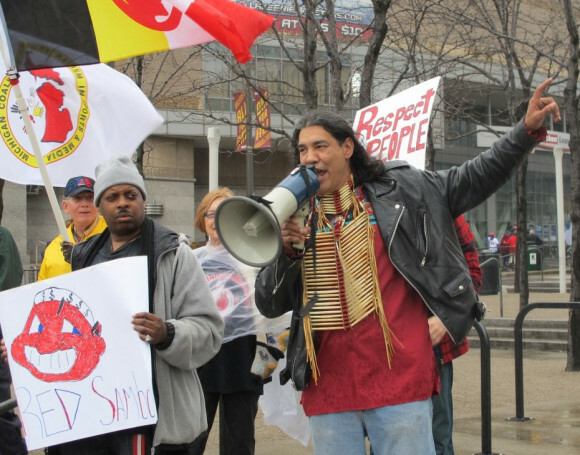 To learn more about the ongoing debate, I reached out to the Executive Director of the American Indian Movement of Ohio, Philip Yenyo, who has organized for decades with Indigenous groups across the Midwest in efforts to abolish the team name and logo. Of course, much of the disagreement over Cleveland’s team name boils down to identity and personal experience, between those impacted and those who are not. Like with most social issues, the less proximate we are to a problem, the less likely we are to relate to it, and in turn pay attention to it. I think it is impossible for most of us white Americans to imagine a reverse situation in which we had a genocide committed against us, were confined to reservations, then had our culture reduced to an exoticized symbol and exploited by a multi-billion-dollar business from which we don’t see a penny of. It is daunting to face our nation’s dark past, but too often history and context are absent from the Chief Wahoo discussion. An absence consistent across the board in misguided criticism of movements like Black Lives Matter, Standing Rock, or NFL teams taking a knee. The dominant narratives created by lifelong fans are that it’s ‘just a mascot’, that those protesting the name are too sensitive, or that Indigenous people don’t understand the name is actually honoring them. But when we listen to Indigenous voices across the country or outside Progressive Field, we learn otherwise—that the mascot is deeply harmful to them and their families. We also learn that everyone has a stake in this: non-Indigenous communities are also fed a myth by the perpetuation of these stereotypes, which plant seeds of racial bias in youth from a young age. A report by the American Psychological Association in 2001 states, “the continued use of American Indian mascots, symbols, images, and personalities undermines the educational experiences of members of all communities– especially those who have had little or no contact with Indigenous people.” To be clear, everyone will benefit once the name is changed. However, until we collectively realize this, we are presented with a choice: to maintain or relinquish our comfort in the face of people looking us in the eyes, asking us to listen and change. As the cliché goes, what side of history do we want to be on? As Confederate statues continue to crumble in the wake of white terrorism in Charlottesville, it is evident how many symbols remain from the underbelly of US history that often go unchecked– many symbols that never should have been, like Chief Wahoo. Around 1,000 Native American-themed mascots still exist in schools around the US, with about 60 per year that decide to change their name. Furthermore, many professional teams have made smooth transitions to new names without losing their fan base. It is a pretty common occurrence. Many surveys have circulated inquiring about a new name, so it is time to pick one and keep it moving. In the meantime, it is difficult to find a greater irony in 2017 than driving down 90-East and seeing a stadium labeled “progressive” in all caps, with the name “Indians” just below, referring to an entire race of people. ~ Peter Saudek is a fair housing investigator in Cleveland, who writes and organizes around racial justice and mass incarceration. Like me, I am sure most Americans have had similar stories to Peter, but most don’t educate themselves to come to the conclusion that he has arrived at. I’m a typical wasichu from NY, but over 25 years ago was introduced to Inipi, and now am a Chanuppa carrier and lead Inipi, so change can come, but we have to be open to the possibilities first. Having spent a lot of time at Wounded Knee and seen the results of the genocide against the Lakota Oyate, a simple act of conscience is all it would take for all teams, from elementary through the pros, to change their names to one that doesn’t harm the Indigenous People’s and reflect the racism systemic and endemic in ameriKKKa. Mitakuye Oyasin. In Maine recently (speaking of Passamaquoddy), despite a major Native American Land Settlement of Maine circa 1980, the Penobscot Tribe (for whom the Penobscot River was named, since it flows through their traditional territory, were ruled against by the state via its court who declared that the Penobscot nation had no sovereignty over the river itself, only the land adjacent to it. This despite the tribe having been superb stewards of the river as much as they have been allowed, and have never excluded use by other people. This is a major issue here in Maine NOW since with the state in control, they apparently want to allow polluting industries to dump waste into the river after years of Native efforts to bring it closer to pristine condition. Fortunately, many white people has become alert to the situation and are becoming allies in the struggle, just as predicted by Penobscot prophesy.